American labor is flexing its muscles against the Trump administration. Loosely coordinated work stoppages took place across the United States in February, and more are on the horizon. On Thursday, Feb. 16, thousands of workers walked off the job for a “Day Without an Immigrant” protest, leaving restaurants closed and construction sites empty from Washington to San Francisco. The strikes come on the heels of the Women’s March, nationwide protests at airports against Trump’s travel ban, mass civil disobediences against deportations, and a strike by Yemeni bodega owners in New York City. They are part of a growing push to go beyond demonstrations and use economic power against the Trump administration. More walkouts are planned, including a national women’s strike on March 8, International Women’s Day. INDYSTRUCTIBLE: A new podcast from The Indypendent telling stories of resistance in Trump's America. Subscribe for free on iTunes. Both Strike4Democracy and the organizers behind the Women’s Day protests have labeled their days of action a general strike, a term that has been met with some derision for lacking realism. A number of citywide general strikes took place during the first half of the 20th century, in Seattle, San Francisco, Oakland, Minneapolis, Rochester, New York, and Stamford, Connecticut among others. Another happened in Oakland in 2011, at the height of the Occupy movement. But there has never been a nationwide general strike or, for that matter, a gender-wide strike, in the United States. With just 11 percent of the U.S. workforce unionized, down from 20 percent a quarter-century ago, calls for a general strike today are more aspirational than practical, but organizers of the upcoming strikes are banking that the national wave of revulsion to Trump will inspire people to act. They note that 200,000 people were expected at the Jan. 21 Women’s March in Washington, and more than twice that number arrived. 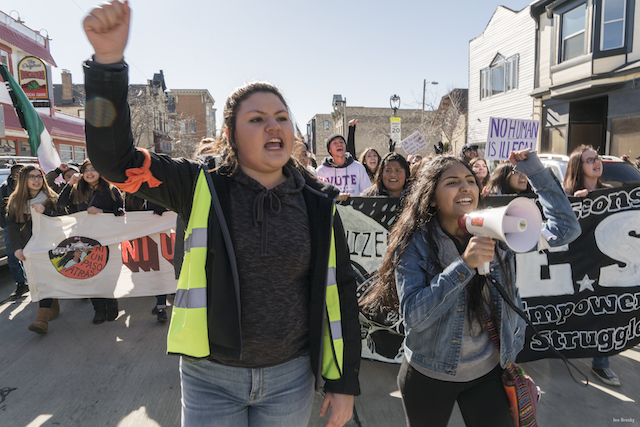 “We’re starting to see new forms of struggle emerging and new ways of conceiving of these struggles,” says women’s strike organizer Kate Doyle Griffiths, an adjunct professor at Hunter and Marymount colleges. “I hope that people who are organizing in their workplaces will take this call as a time to do a shop floor action, to walk out of work, to help build their networks in their workplaces.” People who aren’t already engaged in workplace organizing can use the strike as an opportunity to start, Griffiths added. According to Jeremy Brecher, author of more than a dozen books on labor and social movements, there’s power in simply raising the specter of a national walkout. “The idea of a general strike shows, ‘Oh yeah, well of course, if everybody stops working, obviously they would have a tremendous power to determine what’s going on in society,’” he says. Putting it out as an idea, “even if it’s not an immediately realizable strategy,” is a crucial step to making a general strike a reality. These general-strike calls are not coming from traditional unions, from already existing organizations, or even from specific movements, other than what might be broadly defined as “the resistance.” Some of the people involved are veterans of past social movements — Occupy, Black Lives Matter, opposition to the Dakota Access Pipeline — but others are not. But as news of the “Day Without an Immigrant” and Strike4Democracy spread on social media, it prompted people to talk with their coworkers and to participate in the strikes, with little advance planning. Not unsurprisingly, traditional labor unions were largely absent. The Labor Management Relations Act of 1947, commonly known as the Taft-Hartley Act, forbids political or sympathy strikes. It also requires unions to give employers advance notice before walking out. If American workers want to flex their political power beyond the confines of Taft-Hartley, Brecher says, one direction they will have to explore is a strategy long championed by anarchist groups, such as the Industrial Workers of the World (IWW). It entails creating informal unions that act as unions structurally but refuse to sign contracts, to avoid the ensuing legal restrictions. That informal-union strategy might become more pertinent in the years ahead. Since 2011, six states, all in the industrial Midwest, have outlawed the union shop. A bill to do that nationwide has been introduced in Congress, and Trump has endorsed the concept. Only during rare instances have Internet-based calls to action been enough to drive people out of their workplaces and into the streets — the Arab Spring, Occupy Wall Street — and they have never proven enough to sustain social movements over the long haul. Whether activists can maintain the momentum they have attracted, let alone launch a successful general strike, will likely depend on their ability to build organizations that can sustain themselves in the years ahead. The Trump administration loves 'alternative facts' and hates a free press. Your backing keeps us strong. Become a subscriber or a monthly sustainer today and show your support for independent media.